The new Panda Titanium 2006 Antivirus+Antispyware protects you permanently and automatically against all types of viruses and spyware. To guarantee your security, it offers a double layer of protection against unknown viruses and intruders thanks to its TruPrevent™ Technologies. It also protects you from hackers, phishing and other online fraud. all types of viruses, worms and Trojans without you having to lift a finger. In addition, TruPrevent™ Technologies give you double protection against new viruses. NEW! Keep your PC free from spyware. There are many programs that snoop on your Internet habits and then secretly use your private information without your permission, with terrible consequences. Spyware not only violates your privacy, it can also slow your system, change your computer’s settings, and install junk programs without your permission, etc. Titanium 2006 detects and eliminates spyware and other annoying programs that install themselves on your computer without your permission. Protect your privacy and keep your PC troublefree! Every day hackers are coming up with new ways of destroying or stealing your information. 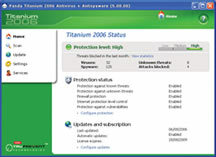 Titanium 2006 offers improved firewall technology to block intruders, turning your computer into a security fortress. 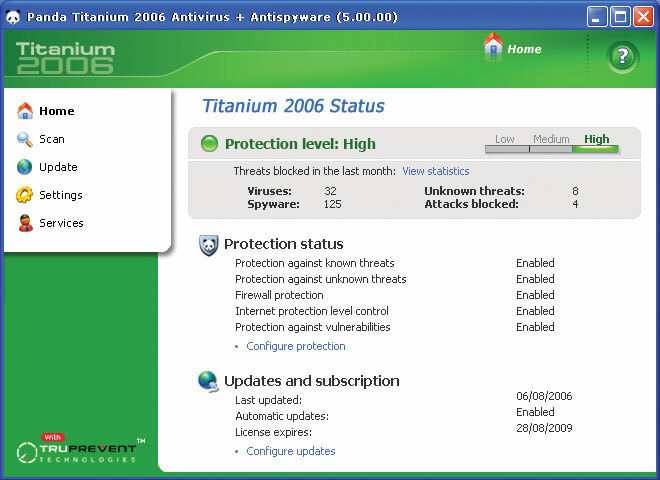 Titanium 2006 also prevents intruders from entering your computer through Wi-Fi connections. Stop anyone entering your PC without your permission! NEW! Protection against phishing and other online fraud. New online fraud scams emerge every day, such as forged emails that link to phony web pages in order to steal your bank details. Plus it blocks secret dialers that hijack your modem to dial premium rate numbers. Bank and shop online with complete peace of mind! Simple to use: install it and forget about viruses and spyware. It is automatically updated at least once a day to protect against viruses and other threats. Its innovative TruPreventTM Technologies, integrated in a latest generation anti-malware engine, ensure maximum effectiveness in detecting and eliminating all types of malware (viruses, spyware, phishing...). Its Ultrafast search engine, thoroughly and rapidly scans all information and barely uses the resources of your computer. As a result, you are protected without even noticing it. Titanium 2006 warns you when there is a high risk of infection in the Internet.